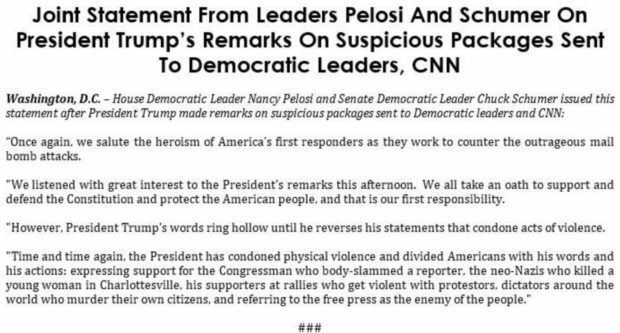 House Democratic Leader Nancy Pelosi wasted no time in blaming President Trump’s rhetoric for the mailing of suspected explosive devices to prominent Democrats. When the shoe was on the other foot, and it was Republicans targeted by a would-be assassin, she dismissed the idea that liberal rhetoric could have played any role. Last year, however, Pelosi angrily dismissed suggestions that heated Democratic rhetoric played any role in the attempted mass murder of Republican Members of Congress by liberal activist James Hodgkinson over GOP plans to reform health care laws. “How dare they,” Pelosi said at a press conference when it was suggested that heated Democratic rhetoric played any part in inspiring Hodgkinson’s actions.